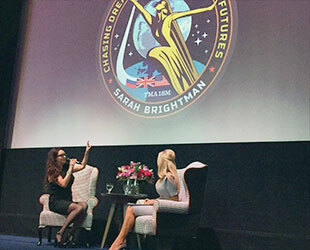 — British soprano Sarah Brightman will be "chasing dreams" and "shaping futures" when she lifts off on a self-funded trip to the International Space Station in September, the recording artist said as she revealed her personal mission patch at a press conference in London on Tuesday (March 10). 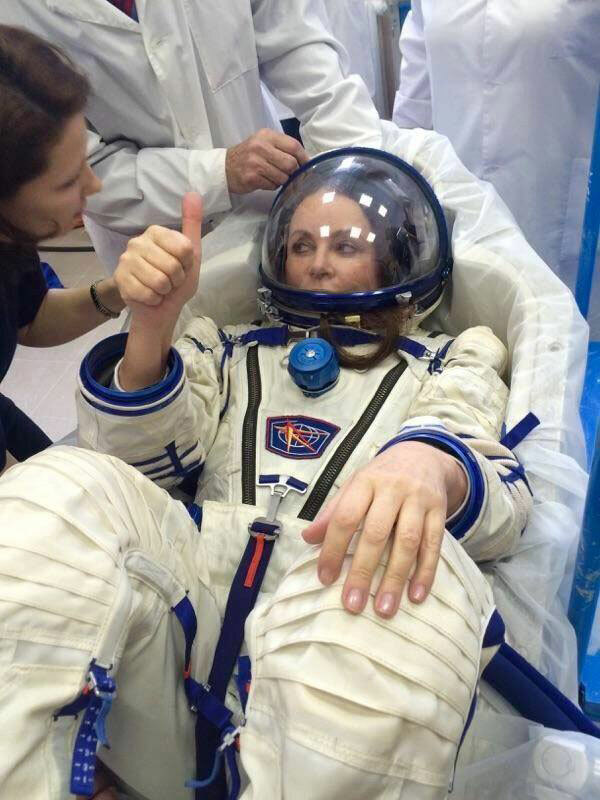 Brightman, who first announced her plans to fly to space in 2012, has been training at Russia's Gagarin Cosmonaut Training Center in Star City, near Moscow, since January. She is scheduled to launch on Sept. 1 as a member of the Soyuz TMA-18M crew for a 10-day stay aboard the space station, during which time she intends to become the first professional musician to sing from orbit. "I'm trying to find a piece that is beautiful and simple in its message, as well as not complicated to sing," Brightman explained. "I've been working a little with my ex-husband, [composer] Andrew Lloyd Webber, who has actually come up with the most beautiful line for something. We are just taking it slowly at the moment." Brightman, who used the press conference to address the rumors she was not paying for the reported $52 million trip herself ("I can't contractually say what the amount is, but it's good that I paid for it myself because it is something I am very committed to.") also announced partnerships with UNESCO and the Challenger Center for Space Education to engage people, and especially children, in her mission. 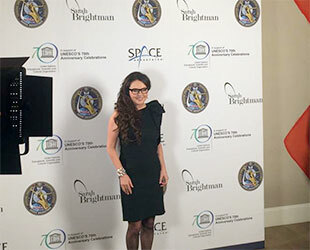 "I hope I can encourage others to take inspiration from my journey, both to chase down their own dreams and to help fulfill important global objectives," Brightman said in video played at the start of the conference. "I have searched for ways to engage people via partners, who already operate a number of programs that have a global presence which positively impact individuals." 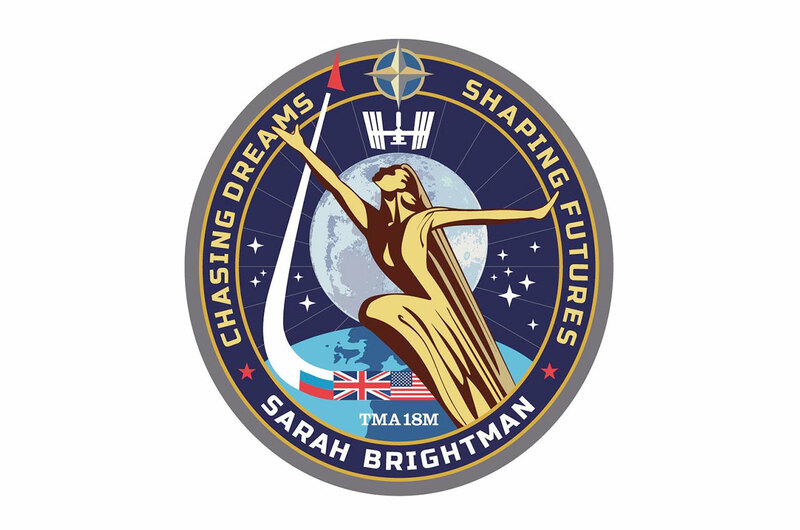 Brightman also spoke about her personal mission patch, a circular emblem that displays her chosen motto, "Chasing Dreams, Shaping Futures." "'Chasing Dreams,' I mean this has been a dream of mine so obvious that's there, and 'Shaping Futures' is obviously space is going to be everybody's future," the singer said. "'Shaping Futures' is really about children and their future and what it is going to be." 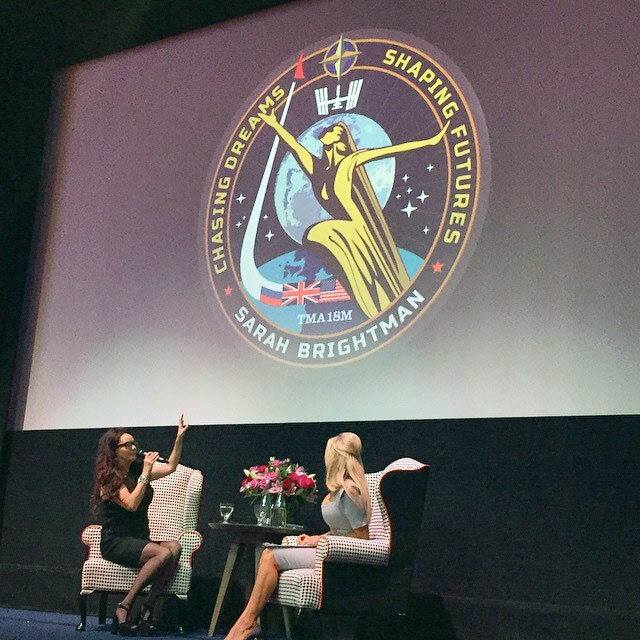 The patch features the flags of the United States, United Kingdom and Russia, which Brightman said symbolized how she "went through the Americans to get to Russia" — via the U.S. space tourism agency Space Adventures — and represents her own country, Britain. Central to Brightman's insignia is a stylized female figure soaring toward space. "The figure in the middle was taken from 60s Russian art," she described. "I collect a lot of the [first cosmonaut Yuri] Gagarin posters from that time and art from that time. This is sort of taken from the idea of one of those." "You can see performance in there as well, sort of going out to the heavens, going out to space," Brightman said. The mission patch also depicts the space station, the star statue that greets visitors to Star City, the Earth, and the moon. "I wanted to have the moon behind the figure because it was seeing the first man [walk] on the moon that made me realize that this was really something I wanted to do and it changed my life," Brightman said, referring to how seeing astronauts on the moon in 1969 challenged her to pursue her own dreams. 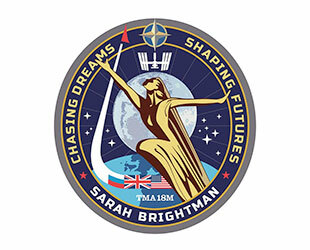 Beyond the symbolism of the patch, Brightman said that, above all else, she hopes the her spaceflight will help her better understand the Earth. "In talking with everybody who has been up, they say they do understand our planet better after seeing how beautiful it is," Brightman said. "We always think in this whole idea of space how unimportant we might be, but actually I think we're incredibly important because we've been given this beautiful place to look after. It is up to us to look after it." "I think when you are up there, you really, really see that. I want to experience that." 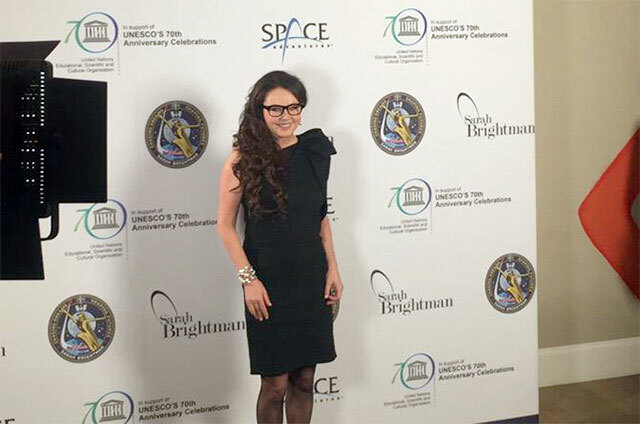 For more information about Sarah Brightman and her flight to the space station, see SarahBrightman.com.